Of the six living Caiman species, Caiman crocodilus (Linnaeus, 1758) is the most widespread, being distributed in South and Central America, parts of the Caribbean, and has even been introduced into the United States. Over much of its range C. crocodilus is abundant, with over one million animals currently living in the wild. The present success of this species may be due to the difficulty in tanning its skin relative to the other caiman species. This success, however, may be short lived as hunting pressures on C. crocodilus have increased recently in response to decreasing population level in the other caiman species. Caiman crocodilus prefers wetland and riverine habitats, usually those with slow moving water; although it has adapted to nearly all wet lowland areas. Most of the caiman’s diet is composed of other vertebrates, including fish, amphibians, reptiles, birds, and some mammals. Caimans are not particularly large, averaging only 2 to 2.5 meters long (occasionally reaching 3 meters in length). Within the group Crocodylia, caimans are member of the Alligatoridae, a group that diverged from other crocodiles in the late Cretaceous. Caimans separated from other alligators approximately 30 million years ago. Much confusion surrounds the taxonomy of caimans. For example, Caiman crocodilus replaced the original name, Lacerta crocodilus; however, some workers prefer a third term, Caiman sclerops, due to the confusion engendered by using crocodilus to describe a caiman. The subspecific taxonomy is also somewhat confused with at least two subspecies and as many as five being recognized. Numerous common names are applied to C. crocodilus including the common caiman, spectacled caiman, caiman blanco, caiman de Brasil, and several others. This specimen, collected in Choco, Colombia, was made available to The University of Texas High-Resolution X-ray CT Facility for scanning by the Field Museum of Natural History. Funding for scanning was provided by a National Science Foundation Digital Libraries Initiative grant to Dr. Timothy Rowe of The University of Texas at Austin. This specimen was scanned by Matthew Colbert on 9 December 2002 along the coronal axis for a total of 945 slices. Each slice is 0.142 mm thick, with an interslice spacing of 0.142 mm and a field of reconstruction of 67.0 mm. Brochu, C.A. 1999. Phylogenetics, taxonomy, and historical biogeography of Alligatoroidea; pp. 9–100 in T. Rowe, C. A. Brochu, and K. Kishi (eds. ), Cranial Morphology of Alligator and Phylogeny of Alligatoroidae. Society of Vertebrate Paleontology Memoir 6, Journal of Vertebrate Paleontology 19, supplement to number 2. Brochu, C. A. and L. D. Densmore. 2001. Crocodile phylogenetics: a review of current progress: pp. 3-8 in G. Grigg, F. Seebacher, and C. E. Franklin (eds. ), Crocodilian Biology and Evolution. Surrey Beatty and Sons, Sydney. Chiappe, Luis M. 1988. Un nuevo Caiman (Crocodylia, Alligatoridae) de la Formación Tremembé (Oligoceno), Estado de São Paulo, Brasil, y su significado paleoclimático. Paula-Coutiana 3:49-66.
de Gasparini, Z. B. 1981. Los Crocodylia fosiles de la Argentina. Ameghiniana 18:177-205. Gorzula, S and Seijas, A.E. 1989. The common caiman: pp. 44-61 in Crocodiles: Their Ecology, Management and Conservation. A Special Publication of the IUCN/SSC Crocodile Specialist Group. IUCN, Gland, Switzerland. Iordansky, N. N. 1973. The skull of the Crocodilia: pp. 201–262 in C. Gans and T. S. Parsons (eds. ), Biology of the Reptilia, Vol. 4, Morphology D. Academic Press, London. Langston, W. 1973. The crocodilian skull in historical perspective; pp. 263–284 in C. Gans and T. S. Parsons (eds. ), Biology of the Reptilia, Vol. 4, Morphology D. Academic Press, London. Medem, F. 1960. Notes on the Paraguay caiman, Caiman yacare Daudin. Mitteilungen aus dem Zoologische Museum in Berlin 36:129-142. Medem, F. 1981. Nomenclatura. Pages 53-64. Los Crocodylia de Sur America Vol. I: Colombia. Ministerio de Educacion Nacional, Bogota. Medem, F. 1983. Nomenclatura. Pages 23-29. Los Crocodylia de Sur America Vol. II. Ministerio de Educacion Nacional, Bogota. Wegner, R. N. 1958. Die Nebenhölen der Nase bei an Krokodilen. Wissenschaftlichen Zeitschrift der Ernst Moritz Arndt-Universität Greifswald 7:1–39. Witmer, L. M. 1995. Homology of facial structures in extant archosaurs (birds and crocodilians), with special reference to paranasal pneumaticity and nasal conchae. Journal of Morphology 225:269–327. 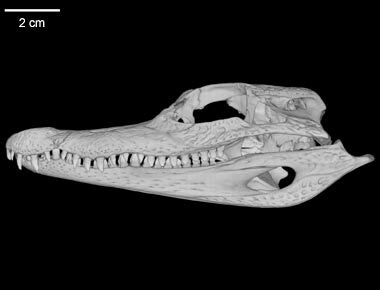 To cite this page: Dr. Nina Triche, 2003, "Caiman crocodilus" (On-line), Digital Morphology. Accessed April 25, 2019 at http://digimorph.org/specimens/Caiman_crocodilus/.